Providing Small Business Owners with Professional, Fill-in-the-Blank Templates for All Kinds of Marketing Activities. What if you could quickly and easily become the marketer you know you need to be? What if your follow-up emails were already written? 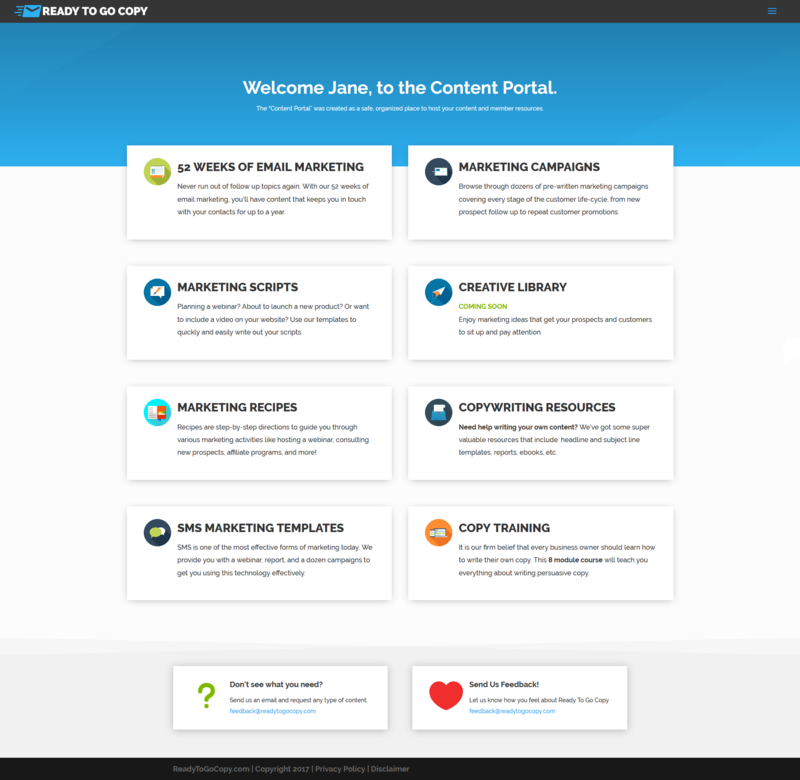 What if you had copy templates for ALL your marketing activities? What if you had a year’s worth of content already planned out? What if you could access video scripts that only needed your personal details? 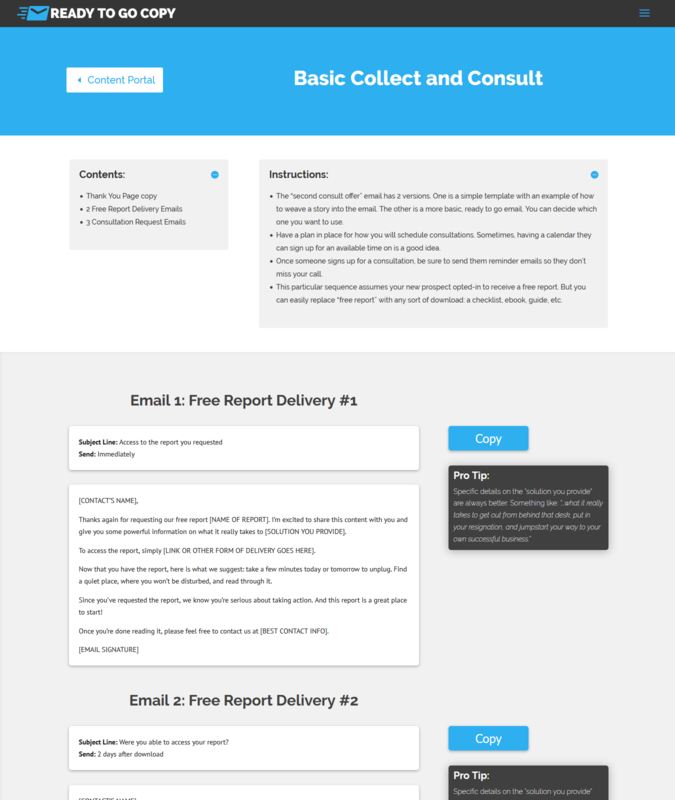 What if dozens of subject lines, headlines, and text messages were at your disposal? Ready To Go Copy is about to become your absolute favorite resource. Why? Because within minutes, you can be sending clear, effective messages to all of your prospects and customers. If “Content is King” (you’ve heard that one, right?) then consider yourself royalty. Because our content library grows every week, and you can have access to the entire thing. 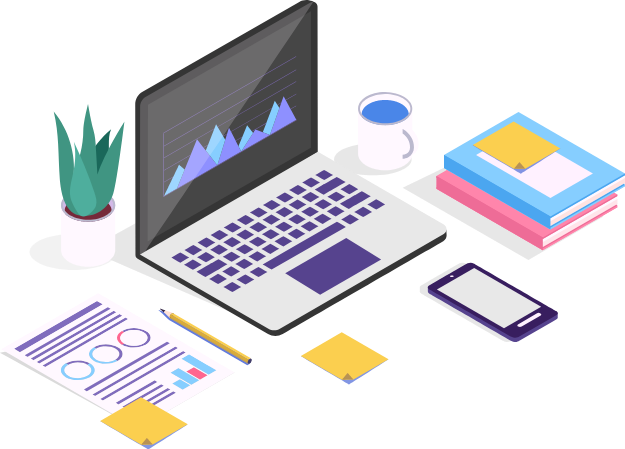 Our years of marketing experience is shared in our easy-to-follow, setup instructions and the pro tips we include with each marketing piece will help you personalize your content. With a single click of your mouse, you can accurately select and copy the content you're ready to paste. As you provide feedback about the copy, we'll add subject lines, content revisions, and additional marketing pieces to produce even greater results. You'll be notified every time we add something new. Each strategy includes all the pieces you need to successfully launch a marketing campaign, including sales and landing pages, emails, thank you pages, etc. Your content will be safely delivered to your content portal - so you always have quick access to it. Thank you for creating this comprehensive and timely membership beta site! We find it very well organized, easy to navigate/use and find the “pro tips” especially helpful. I’ve been asking for referrals of books or courses that teach email copywriting, but haven’t seen anything as comprehensive as Ready to Go Copy! Tyler Garns of Box Out Marketing shared the link as I’m a member of his IFS Success Lab. It’s a godsend for those of us who don’t want to waste time trying to learn another skill. Stephanie is unlike any other copywriter we've ever worked with. Not only is she a fantastic and results-driven copywriter, but unlike other content creators, she truly excels at messaging, persuasion, human psychology and email marketing best practices. Have a Question or Copy Request? Do You Know Someone Who Owns A Business? Because If You Do…We Could Be Sending You Commission Checks!